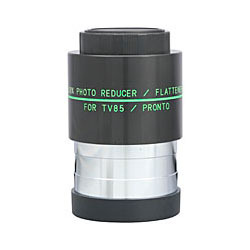 Model TRF-2008 0.8x Reducer/Flattener converts TV-85 to 480mm f/5.6 and TV-76 to 380mm f/5.0 for flat field, fast photography. Fully multi-coated 3-element unit inserts directly into 2" focuser, accepts standard T-rings for 35mm cameras. "This accessory is a must-have for someone planning to use the TV-85 photographically" - review in Sky & Telescope, July 1999. Also it can be used with any 400-600mm refractor.